With the stellar success of the Iron Man film franchise, it's easy to forget that the Golden Avenger wasn't always the major player in the Marvel Universe that he is now. He's never exactly been a C-lister, but until Robert Downey Jr. infused the role with his irresistible humor and charisma, you couldn't exactly call him an A-lister either. The Marvel Comics 2006 event Civil War – with Tony Stark at the head of the pro-government side of the conflict — helped push the hero closer to the front of the Marvel stable, but even then, the fact that Iron Man backed the less popular (but winning) side of that clash did more for Captain America's popularity than his own. The release of Iron Man and the deafening praise from critics and audiences changed all that — and his continuing appearances in Iron Man sequels, in each Avengers film, his prominent role in Captain America: Civil War, and even his cameo in Incredible Hulk have made Iron Man as inseparable from the Marvel brand as Spider-Man. Because so much of his popularity is based on the films, it's easy to forget how much the source material differs from what you've seen on the big screen. So as a little reminder, here's the untold truth of Iron Man. 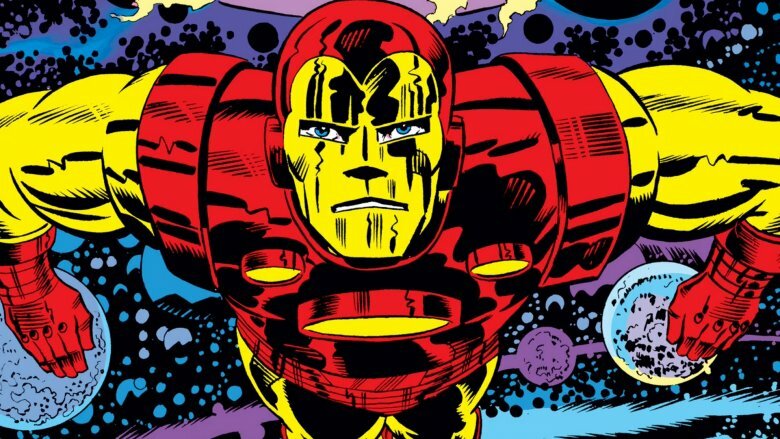 Iron Man may have been the first of MCU's heroes to hit the screen, but he wasn't the first Iron Man in comics. The very first comic book hero named Iron Man had nothing to do with Marvel, with cutting edge technology, or even with the United States. In the 2006 book Invaders from the North: How Canada Conquered the Comic Book Universe, author John Bell tells readers about how American comic books were one of the casualties of Canada's War Exchange Conservation Act of 1940. 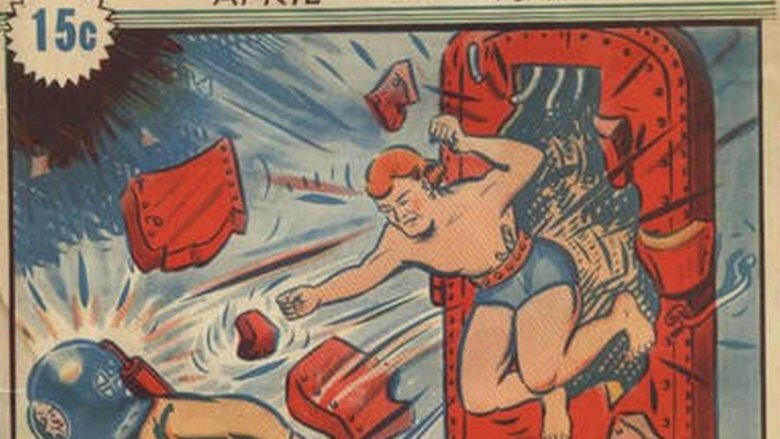 Canada suffered a trade deficit with the U.S. in 1940, and in order to fight it, the Act stopped the import of non-essential goods from the States, including comic books. According to Bell, Maple Leaf Publishing was one of a number of Canadian companies that rushed to fill the void. The Canadian Iron Man was first featured in Maple Leaf's Better Comics #1. Created by former Disney artist Vernon Miller, Maple Leaf's Iron Man was the sole survivor of an aquatic race. Like many comic book heroes of the time, this first Iron Man used his powers to fight the Third Reich. There's no evidence Marvel's Iron Man had any connection with Maple Leaf's, though considering the original Iron Man's aquatic origins, maybe this has something to do with why Iron Man and Namor never seem to get along. The opening scene of 2008's Iron Man is set in Afghanistan. We meet Tony Stark as a military convoy escorts him through the desert, unaware of the ambush that will bring a tragic end to the soldiers' lives and a heroic rebirth to Stark's. 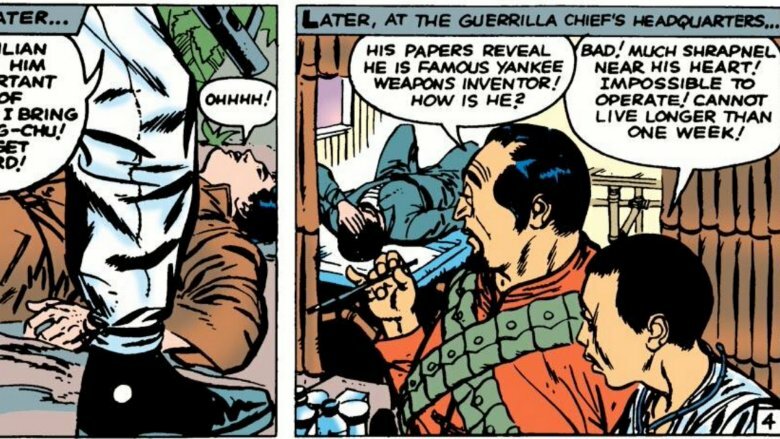 But since most Americans likely didn't even know the name "Afghanistan" in 1963, Tony Stark's origin in Tales of Suspense #39 was set in a more recognizable locale: Vietnam. According to Stan Lee, his goals for the story of Tony Stark rendered Vietnam a fitting setting. During his commentary on the Iron Man 2-Disc "Ultimate Edition" DVD, Lee knew exactly who the Marvel readership was and he wanted to create a character that challenged both himself and his readers. "The readers, the young readers, if there was one thing they hated, it was war, it was the military," Lee pointed out. "He was a weapons manufacturer, he was providing weapons for the Army, he was rich, he was an industrialist…I thought it would be fun to take the kind of character that nobody would like, none of our readers would like, and shove him down their throats and make them like him." Considering the "dare" Stark represented to Lee, in 1963 there could be no better setting than the place whose conflict was part of what was making those "young readers" rail against the Tony Starks of the world. 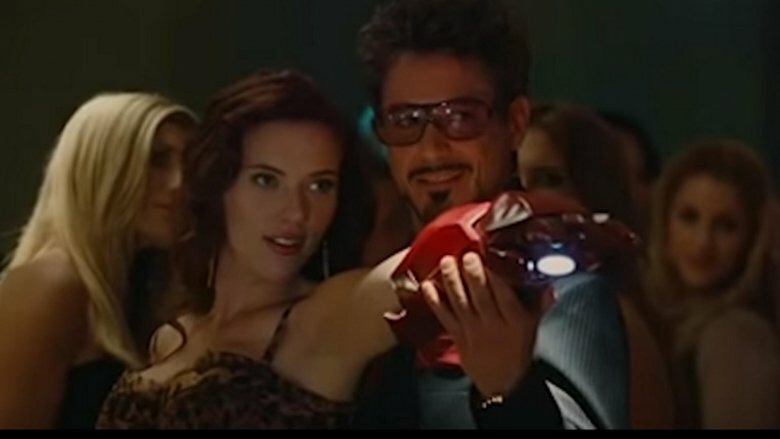 Women like Tony Stark in the movies. And in the comics. We know that. They like him a lot. According to Stan Lee, since the very beginning, that appeal has extended into the real world. On a behind-the-scenes feature on the Iron Man 2-disc "Ultimate" edition, Lee says, "Of all the comic books we published at Marvel, we got more fan mail for Iron Man from women, from females, than any other title…We didn't get much fan mail from girls, but whenever we did, the letter was usually addressed to Iron Man." Robert Downey Jr. echoed this tidbit at the 2010 premiere of Iron Man 2 in Los Angeles, telling reporters he thought the reason women liked the hero was that "he's a bit more vulnerable and reminds them of their snotty boyfriends that they wish to calm down." Downey went on to clarify, "We didn't necessarily design it that way. I think part of it was always in the fabric of the Iron Man story." If you only know Iron Man from the movies, you may be surprised to learn that for the majority of his existence, Stark kept his identity a secret. Remember the end of Iron Man when Tony casts doubt that anyone would believe Agent Coulson's cover story that Iron Man is Tony Stark's bodyguard? Well, just about every man, woman, and child of the Marvel Universe bought that lie for decades. Though introduced to Marvel in 1963, Iron Man didn't reveal his true identity until 2002's Iron Man #55, when he donned his armor in public without any attempt to hide. He didn't do it because a villain was blackmailing him, because he had no choice if the world was to be saved, or because he simply felt it was time he take responsibility for his actions not only as Tony Stark but as Iron Man. He did it to save a dog. Seeing there was a dog that had gotten loose from its owner on the street below — and that it was about to be hit by a bank robbery getaway car — Stark leaped off a building, opening his briefcase and drawing his Iron Man suit to him in the process. The dog was saved, the bank robbers were caught, and all was right with the world. Though his girlfriend was pretty angry. According to Stan Lee, the reason he gave so many of his characters names with identical first and last initials (e.g., Peter Parker, Bruce Banner, Reed Richards, Matt Murdock) was because he was writing just about every Marvel Comic at the dawn of its Silver Age of superheroes, and the alliteration of the names helped him remember who was who. One of the funnier moments from the history of Iron Man may serve to prove Lee's memory needed the extra help. According to Sean Howe's Marvel Comics: The Untold Story, in 1974 Lee was looking through pages of Iron Man when he asked then Editor-in-Chief Roy Thomas "Shouldn't he have a nose?" Howe says this was an "offhand remark," but regardless it sent "the office scrambling." By Iron Man #68, Iron Man's faceplate was being drawn with its own nose. Iron Man's Iron Nose lasted around a year and a half, and it ended with as abrupt a comment from Lee as the one that started it. According to Howe's book, by 1976 Lee was dealing less with the creative side of Marvel than the dollars and cents, but occasionally he still looked through pages. Examining the most recent Iron Man, he reportedly indicated the nose on Iron Man's faceplate and said, "What's this — why is this here?" The unnamed Marvel employee nearby asked him if he didn't want the nose. Lee responded, "Well, it looks kind of strange, doesn't it?" By Iron Man #85, the nose was gone. 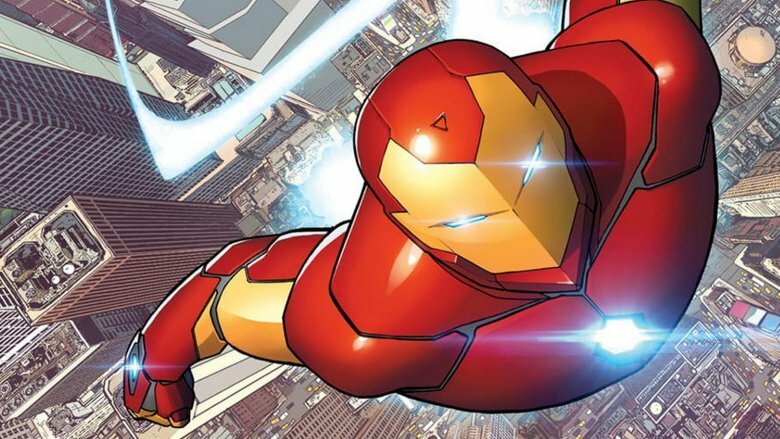 For a CEO and billionaire, Tony Stark isn't great at keeping jobs. Just like the "Stark's bodyguard" comment from Iron Man, Tony's joke in the Congressional hearing in Iron Man 2 that he would "accept" an appointment to Secretary of Defense is right from the comic books too. In 2004's Iron Man #78, Tony Stark was confirmed as the United States Secretary of Defense. His appointment was short-lived, however. 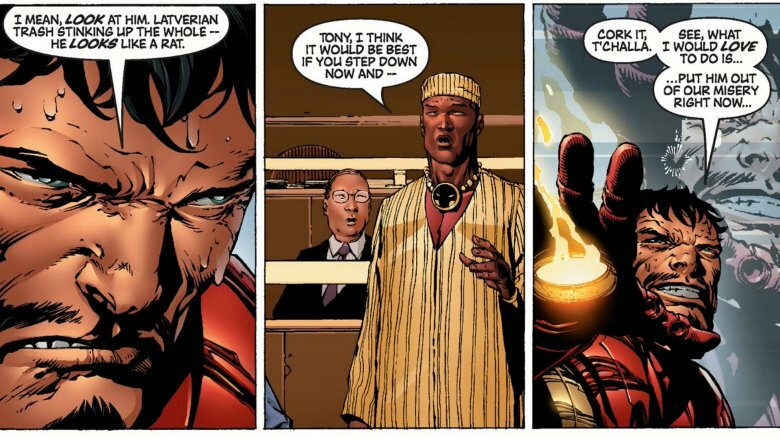 That same year, in Avengers #500, Stark had a meltdown at the United Nations. As part of the Avengers Disassembled event which featured the Scarlet Witch using her powers to destroy her old team, Stark found himself inexplicably drunk at the podium of the UN, though he hadn't taken a sip of anything. Spotting the UN ambassador from Latveria (the country ruled by the literal iron fist of Doctor Doom), the drunk Stark was quickly enraged and threatened the smirking politician. Hank Pym and T'Challa were able to stop Stark from doing anything violent, but the incident lost Tony his cabinet position. But that wouldn't be his last high-profile appointment. In 2007, at the end of Civil War #7, Stark was named Director of S.H.I.E.L.D. The trust he gained from the American public during Civil War would last longer than his cabinet position, but not by much. By the beginning of 2009, with the end of Secret Invasion and Stark's failure to foresee the Skrulls' infiltration of Earth, Stark was ousted as Director of S.H.I.E.L.D. Iron Man has always been an irreplaceable member of the Avengers. He's funded the team with his billions, he staffed the team's support with the loyal Edwin Jarvis (a flesh-and-blood butler rather than the A.I. assistant from the films), he fought back-to-back with other Avengers against impossible odds, and even served as chairman a time or two. Along with all that, he's helped the team in a way that he never expected or intended: by unwittingly helping to recruit future members of the Avengers — even future leaders of the Avengers — by fighting them. Clint Barton, a.k.a. Hawkeye, first found his way into the Marvel Universe in 1964's Tales of Suspense #57. He appeared not as a guest star, but as a villain. Enamored by the seductive Black Widow — who herself was not exactly on the side of the angels back then — Hawkeye was willing to do anything the Soviet spy asked, including fighting Iron Man to help her steal Stark's technology. Eventually, Black Widow abandoned Hawkeye and the archer realized he didn't want to be a criminal anymore. A year later, in Avengers #16, Hawkeye became part of "Cap's Kooky Quartet" – along with Captain America and two other former villains, Quicksilver and the Scarlet Witch — but it would be a while before the archer and Iron Man would trust each other. Often arrogant and rebellious, Hawkeye left the team almost ten years later and briefly joined the ranks of the Defenders right before one of Marvel's first big events — The Avengers/Defenders War — broke out. When Avengers and Defenders paired off against each other, it was Hawkeye and Iron Man who fought in 1973's Defenders #9. Throughout the fight it was clear that though almost a decade had passed in the real world, plenty of animosity still existed between Barton and Stark. 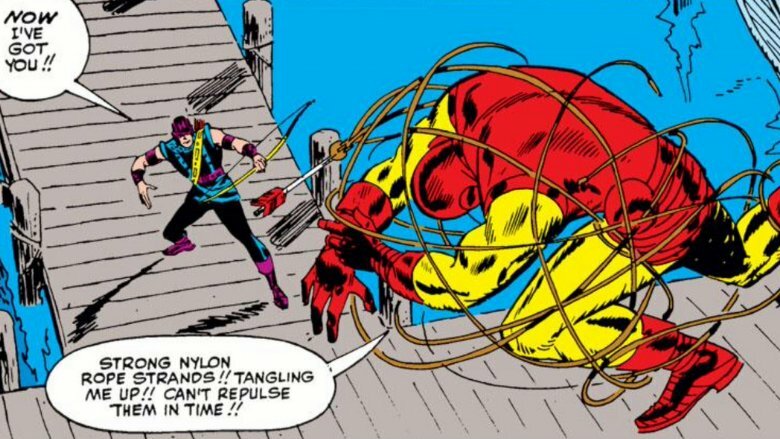 Fences were eventually mended enough that not only did Barton and Stark trust each other as teammates, but Iron Man would agree to work under Hawkeye's leadership in the first incarnation of the West Coast Avengers. Movie fans might be used to referring to Tony Stark and Bruce Banner as "science bros," but in the comics Iron Man and the Hulk have fought each other almost as much as they've worked together. While battles between Marvel heroes usually end in draws, Iron Man has managed two decisive victories over "the strongest one there is." Iron Man's first and most memorable defeat of the Hulk was during a three-part story beginning with 1980's Iron Man #131 which began as most conflicts between friends begin — with Tony Stark stuck on the Long Island Expressway because the Hulk had knocked over a fruit truck and was pigging out on the food. 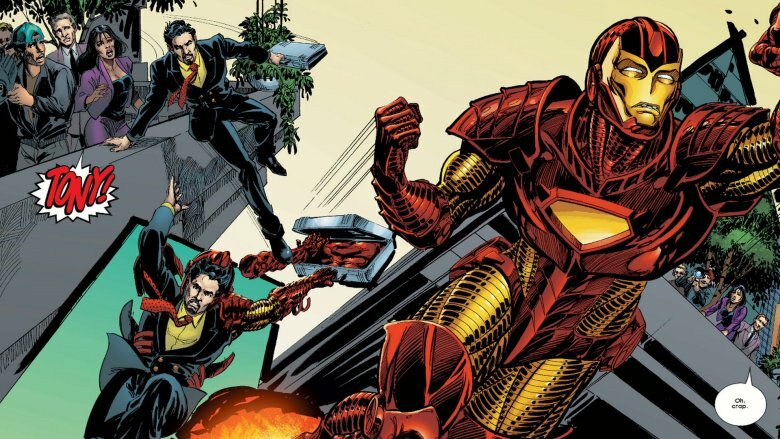 During the next issue's rematch, Iron Man risked something he's never tried before. 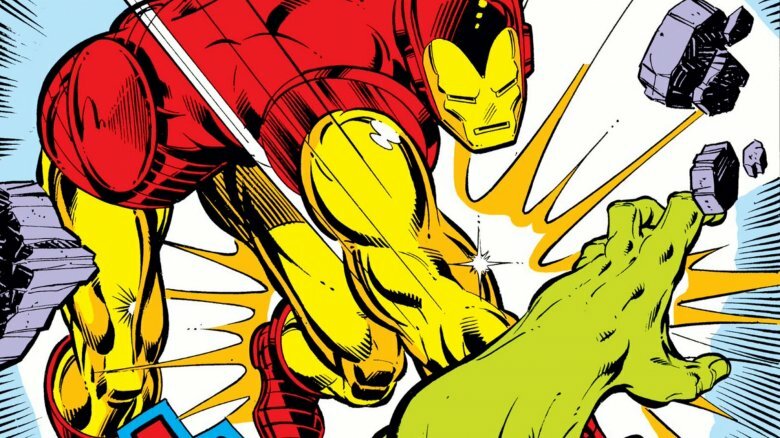 With the Hulk dazed from the explosion of Stark's private Lear jet, Iron Man used the opportunity to summon every drop of his armor's energy into a single punch, and with it he was able to K.O. the Green Goliath. The strike took so much out of the suit that immediately after delivering the decisive blow, the armor froze and clattered to the ground. Ant-Man dropped by in the following issue to free Stark from the suit. Though in not quite so spectacular a fashion, Stark was able to render the Hulk unconscious again in 2009's Mighty Avengers #22 by blasting the Hulk with rocket boosters he'd used in the same issue to propel himself into space. Ironically, as popular as Stark's Hulkbuster armor became, and despite the fact that he's defeated the Hulk in battle twice, in the comics Iron Man has never been able to defeat the Hulk while wearing the Hulkbuster suit. Every Iron Man/Hulk fight involving the Hulkbuster armor has ended in either a draw (Iron Man #305), or with the Hulk the only one left standing (World War Hulk #1, Original Sin #3.4). You hear a lot about Tony Stark's Hulkbuster armor, but the Hulk isn't the only fellow Avenger that Iron Man developed a specific armor to counter. In Marvel's 2003 three-part mini-event Standoff — which ran through Thor, Iron Man, and Avengers — Doctor Doom manipulated international events to set Iron Man, Thor, and Captain America on a collision course. Thor would be more than a match for Iron Man under normal circumstances, and Standoff happened during a time when Thor possessed the Odin-Force, making him more powerful than ever. Not knowing how else he could even stand a chance, Shellhead created his Thorbuster suit. 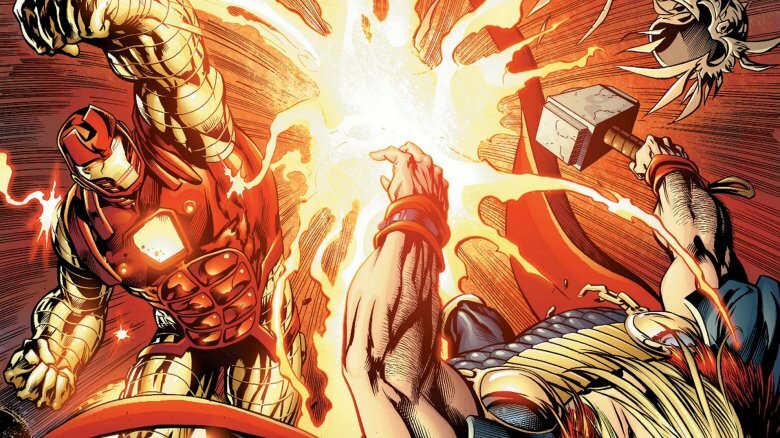 Powered by an Asgardian crystal Thor had given Stark as a gift, the Thorbuster rig looked like a marriage between Tony's classic red-and-gold suit and the Destroyer's armor. When Stark attacked in Iron Man #64, he gave Thor a run for his money. But ultimately, just as is usually the case when Stark breaks out the Hulkbuster suit, it wasn't enough. In the final issue of the mini-event, Avengers #63, Thor destroyed the suit's reactor and Tony ejected from the armor. The battle ended when Thor swung Mjolnir at Captain America hard enough to dent his comrade's shield, and the savagery of the attack made Thor realize he'd taken things too far.